While Wadsworth Atheneum Wedding events are not currently being held at the museum, there have been exceptional celebrations at the venue in the past. A Wadsworth Atheneum Wedding is a different experience, set within a historical building that is filled with masterpieces of European and American artists. The museum takes visitors out of the chaos of downtown Hartford and brings them into classic modern galleries and rooms filled with exceedingly beautiful and transformational works of art. Couples who have chosen the Wadsworth as a wedding venue were able to create unique experiences in either the Morgan Great Hall or Avery Court. The two rooms provide spaces that allow brides and grooms to make their wedding day a very personal experience, and one that can be enjoyed by all who attend. The image above shows a wedding that made use of the open space and lighting of the Avery Court. In the picture, the bride is surrounded by friends on the dance floor. 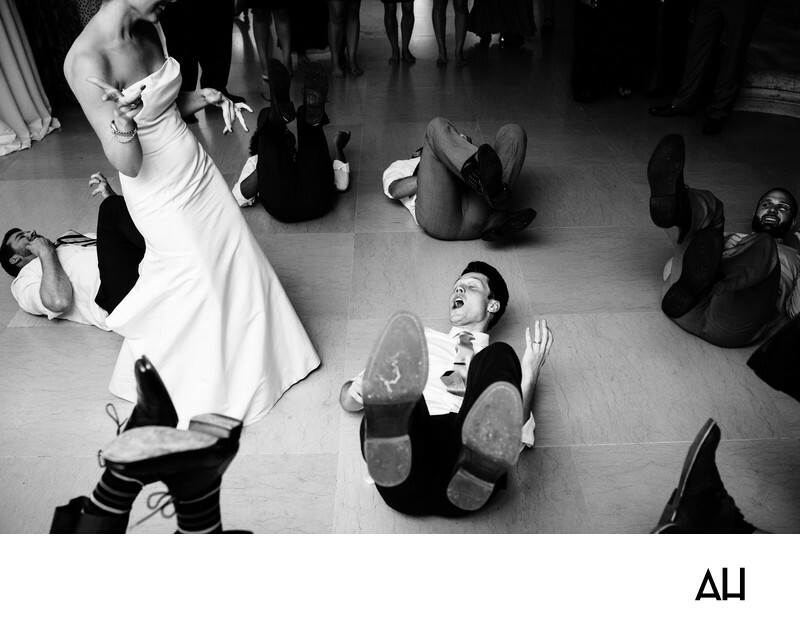 The carefree fun of the reception is captured in this photo, and men on the floor kick their feet up and play air guitars as they sing along with the bride. The bride’s dress is unadorned, but the shape of the skirt makes it stand out as she joins her friends in the festivities. Her smile is wide and her expression one of amusement as she looks down at the men rolling on the floor. The picture is a symbol of the comradery between the couple and their friends, and the delightfully playful nature that was abundant throughout the day.